When you approach the port from the south, a bent one-line breakwater surrounds the port. A red lighthouse is at the north end of the breakwater. 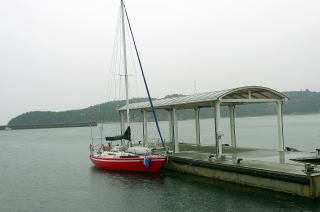 Passing by the lighthouse, you will find Miyanoura Pontoon ( 34 27.450N　133 58.400E) at the port in the east. You may moor at your right side toward the shore, i.e. at the south side, of the pontoon. 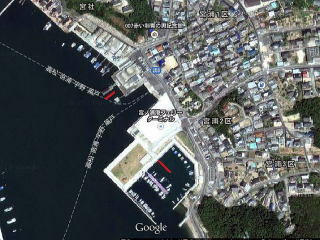 Additional page of above site has photos of an aerial view and the berth. They require your reservation and fee payment three days before your mooring. 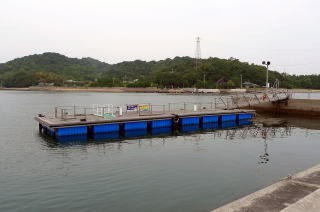 But, if you have no time, they require that you go to Town-Naoshima Tourism Association at the ferry station near the pontoon for your application on the day. The fee is JPY 1,750 for a 12m long boat. While they charge the fee, there is no water nor power at the pontoon. There was no water tap available around Miyanoura. As taps at the toilet are automatic, you can’t take water from them. I asked a toilet cleaner to open the toilet machine room and took water there. A clean and 24hr-open toilet is at the side of the ferry station. A-COOP supermarket is 15 minutes away. I recommend you a worth-watching bathhouse 5 minutes away. This bathhouse is part of art activities in Nao-shima. See below.